My Los Angeles law office serves successful small businesses, entrepreneurs and creative individuals. Trademarks, Copyrights Learn about my services and the fundamentals of trademarks and copyrights. Business Formation Learn about my approach and the benefits of forming a corporation, LLC, or partnership. Business Contracts Read about the value of clear business contracts that protect your interests. Entertainment Law, Music Law and Fashion Law See why it’s useful to have a good attorney with experience in entertainment law, music law and fashion law. My clients include Entrepreneurs, Designers, Manufacturers, Artists, Actors, Retailers, Writers, Web Developers, Consultants, Producers and Production Companies and other Premier Small Businesses located in and outside of Los Angeles. I graduated from Stanford University (B.A., M.A.) and UCLA School of Law (J.D.) and opened my own law firm in Los Angeles after working as an entertainment and music law attorney at Manatt, Phelps, and Phillips, LLP (a top California law firm), as an in-house attorney handling contracts and business affairs at BCBG (a major fashion company), and as an in-house attorney at Palan Music (an international music publishing company which has since merged with MCS). See my bio for details. January 2019: Many people don’t realize that currently, trademarks may be refused registration if the U.S. Patent and Trademark Office deems them to contain “scandalous material”. The U.S. Supreme Court will soon be hearing a case regarding an apparel brand “FUCT” involving precisely this issue. Understanding all of the legal issues affecting your particular trademark is a good reason to engage the services of a trademark attorney to give you up-to-date trademark advice. For more, see “How do I choose a Trademark”? November 2018: In this era of influencers and social media, it’s more important than ever to understand the intellectual property laws regarding copyrights to photographs and protection for brand names. See “What is the Difference between a Trademark and a Copyright”? October 2018: Many clients contact me initially because Amazon’s Brand Registry requires a registered U.S. trademark and a point person for all things having to do with the brand clients want to register with Amazon. Registering trademarks is even more vital than ever for business owners. For more information on the trademark registration process, see “What Steps Do I Take to Apply for My Trademark”? September 2018: I receive many calls from new clients concerning the use of photos on Instagram®. The calls typically concern the use of their photos by another unauthorized party or vice versa. It’s important to understand copyright law and how it impacts the use of photos on social media. For more, see “What Specific Rights Does a Copyright Owner Have”? June 2018: Many clients call me after having received an infringement notice and demand for payment as a result of posting a photo on their website they thought was “free” to use. However, the terms of Creative Commons’ licenses and other allegedly free photo websites are not always simple or clear and could lead to a copyright infringement lawsuit. For more, see “What Specific Rights Does a Copyright Owner Have”? May 2018: Many songwriters are unsure of how to decide what percentage of a song they own with their co-writers, and it can be challenging to bring up the subject of signing a “split sheet” stating percentages, but it’s generally a good idea to agree on splits before writing and certainly before recording. 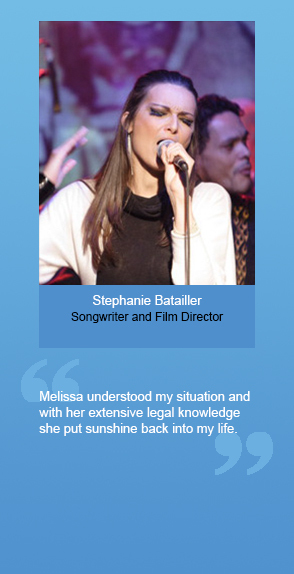 For more information on how music lawyers can handle songwriter issues for you, see “What Do Music Lawyers Do”? April 2018: Many potential clients call assuming it’s safe to use a trademark that’s listed as “dead” on the USPTO’s website, but the analysis of whether it’s safe to use a mark should be conducted by a trademark attorney. Just because a mark shows as “dead” does not indicate you can safely use it. For more about trademarks, see “What Steps Do I Take to Apply for My Trademark”? February 2018: For many of my clients and potential clients the new Trump Tax Bill has created a lot of confusion. While there are some reasons to form a new business entity right now, it is also wise to seek advice from an accountant. 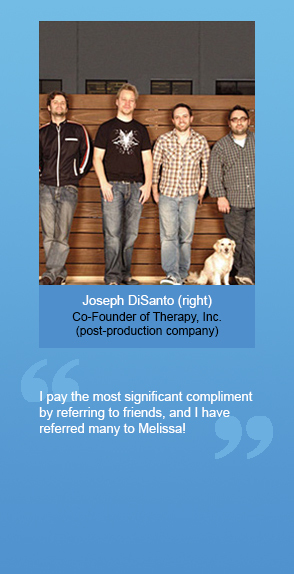 For more information, see “Why Form an LLC”? January 2018: If you have registered your domain name for your business, that is not the same thing as having a registered trademark or brand name for your business. A registered trademark gives the owner the right to exclude certain other businesses from using the same or a confusingly similar name. For more information, see “What is a Trademark”? November 2017: If you have a registered U.S. trademark, the registration can sometimes be used to claim an Instagram user name and / or a Facebook user name. Having a U.S. trademark registration can be a powerful tool for you and your business in the area of social media. For more, see “What is a Trademark”? October 2017: It may not be a good idea to re-post other people’s photos on social media. Such postings may constitute copyright infringement or infringement of the right of publicity. Infringement of the right of publicity is a legal cause of action based on state law. Copyright infringement is a legal cause of action based on federal law. For more, see “What is Copyright Infringement”? September 2017: In order to register on Amazon’s Brand Registry service of monitoring the use of your brand on Amazon, Amazon requires a U.S. trademark registration. Amazon has become a vital platform for many businesses, so trademark registration for many businesses is very important. For more, see “What Steps Do I Take to Apply for My Trademark”? 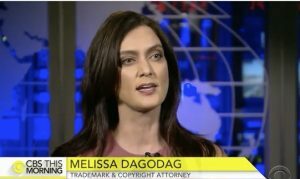 Melissa was interviewed on CBS This Morning on May 3, 2017 about a high profile trademark infringement case involving the band the Eagles. 1. I paid a graphic designer to create a logo for me, so now I own the logo and can use it for free however I want. Example: I spent $5,000 to have my corporate identity (logo, business cards, letterhead and envelopes) designed for me, and now I can use the designs from on social networking sites. This is not true. Unless you have a “work for hire” or “assignment agreement” in writing, you do not likely own the work your designer did on your behalf. Your designer likely still owns it. Generally, you should have an attorney draft a work-for-hire or assignment agreement with specific legally binding language that gives you ownership of the copyrightable material from the designer and the right to do whatever you want with it. 2. If I alter someone else’s creative work by more than 25%, then I am not infringing that person’s copyright when I copy, offer for sale or distribute my own revised version of the work because I made the work my own by adding so much material to it. Example: I take Andy Warhol’s Marilyn Monroe print and change the colors and the size. Since I changed the work a lot, I think I’m not infringing the copyright. This is likely untrue. The measure of copyright infringement is “substantial similarity”–whether or not a reasonable person would find the two works substantially similar based on a number of specific considerations. There is no set percentage by which you can alter a work and be sure to avoid being sued for infringement. If you really want to build on someone else’s work, you should have a copyright attorney “clear” the work by obtaining permissions where necessary. 3. I can use someone else’s trademarked brand in connection with my product or service because mine is a different kind of product or service. Example: I open a café called Blue Berries that does not sell frozen yogurt. Because I don’t sell yogurt, and I changed the name, I assume I am not infringing the Blueberry yogurt chain’s trademark. When it comes to trademark infringement, the issue is whether there is a “likelihood of confusion.” This is determined by weighing several factors. A few of the factors that would be considered are 1) whether consumers are likely to be confused about the source of the product or service; 2) whether the marks are similar in appearance, phonetic sound, or meaning; and 3) whether the marks are used in the same or similar channels of commerce. The determination of likelihood of confusion is a complicated matter. Therefore, don’t just pick a brand name because you like it; you should clear it with a trademark attorney first. If you are sued for trademark infringement, you may have to pay damages; you may have to forfeit all of your profits associated with the trademark; and you may lose all of the time and money you put into your marketing and advertising. 4. I can get a poor man’s copyright by mailing myself a copy of my creation and keeping it in a sealed envelope. Example: I’m a screenwriter in Los Angeles. I mail myself a copy of my latest screenplay, and I keep the sealed envelope in my desk. I believe this gives me an enforceable copyright. This is an urban legend, and the answer is “no”. Mailing your work to yourself isn’t what gives you a copyright (though in some cases it might give you something of value). The screenplay is actually copyrighted the moment you put it on paper. That said, there are real advantages to formally registering the copyright with the U.S. Copyright Office. These include the ability to file a lawsuit for copyright infringement, and when you file in a timely manner, the right to get extra money (statutory damages and attorney’s fees) in such a lawsuit. It is fairly simple to apply for a copyright registration on your own. If you feel more comfortable, you can use an attorney who specializes in copyrights. 5. If a creative work does not have a copyright notice, then it’s not copyrighted, and I can do whatever I want with it. Example: I liked someone else’s blog entry about cars so I copied a few paragraphs from it and posted it on my car aficionado website and even gave the blogger credit. I think this is not copyright infringement because the blogger doesn’t have a copyright notice, and I gave him credit and didn’t copy the whole blog. This is not true for several reasons: 1) Everything created after April 1, 1989 is copyrighted and protected whether or not it has a copyright notice on it. 2) Giving others credit for their work is not the same as getting permission to use their work. 3) Copying a substantial part of a blog word-for-word is likely to be infringement. If you’re not sure, consult with an experienced copyright attorney. 6. If I have a phrase I use for my business, I can copyright it. 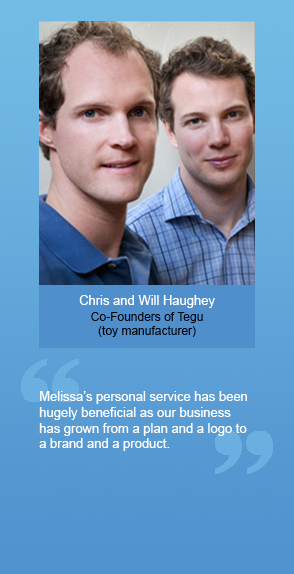 Example: I use the slogan “Goofy Twofer Tuesday” for my business. I can copyright the slogan. There are a few big issues here: 1) There is no copyright for words and short phrases. You may be able to trademark your business slogan, but it’s not copyrightable. 2) In addition, certain kinds of writing are not copyrightable. For example, you can’t copyright a list of addresses. Also, you cannot copyright individual recipes. When it doubt, consult with an attorney. 7. I want to use an old creative work for commercial purposes. Since it’s so old, I can use it for free. Example: I assume that I can use an old oil painting for free on my new line of greeting cards without infringing the copyright. It depends. Just because a work is old doesn’t mean it is in the public domain and therefore free for anyone to use. Particular rules and dates apply to what is and isn’t in the public domain. As a general rule in the U.S., works created after January 1, 1978 maintain copyright protection for 70 years after the author passes away. Also be aware that international copyright laws can be very different from U.S. laws. I am an experienced Los Angeles attorney who works with business law, entertainment law, music law, fashion law and intellectual property law (including trademark law and copyright law). This includes business formation (corporations, partnerships, LLCs), copyright and trademark registration, drafting and negotiating contracts, cease and desist letters, collection letters, infringement settlement, creating business plans, and other legal advice and research. See a summary of the legal services I provide. FORMING BUSINESSES: I can form your business entity properly by filing the appropriate papers with the California Secretary of State and then drafting the appropriate business agreement (such as an Operating Agreement for limited liability companies and Bylaws for a corporation). Since I practice as a business formation attorney in Los Angeles, I also help my clients who live in or around Los Angeles by meeting with them in person in order to sign and review all of the relevant documents; obtain Employer I.D. Numbers (EIN #’s) from the IRS; and gather all of the documents necessary to open company bank accounts. I also write and review business plans to clarify your marketing and business needs and help you find financing. For more information, see forming corporations, partnerships, and LLCs. TRADEMARKS: as an experienced trademark lawyer in Los Angeles, I register and protect your trademarks and service marks (both are commonly known as brand names). I take my clients through the entire trademark application process. I also draft cease and desist letters when people are infringing on your trademarks or copyrights. For example, if you are a designer who sells your furniture throughout the U.S., and you own the trademark for your line of furniture, and you discover another company starts to use the same trademark, I will help you put an end to it. I also handle infringement settlements. When you need a trademark attorney in Los Angeles, my office is an excellent choice. For more information, go to trademark registration, licensing, and infringement issues. CONTRACTS: I draft, review and negotiate a wide array of contracts for clients inside and outside of Los Angeles. See the next paragraph for some of the kinds of contracts I typically draft. Find more information about the services I provide in preparing, negotiating, and reviewing contracts. TYPES OF CONTRACTS: some of the contracts that I typically write, review and negotiate are business formation, business dissolution, trade secret, work-for-hire, employment, non-disclosure, distribution, fashion, sales representative, production (music, film and television), recording artist, songwriter, record producer, music and book publishing, writer, author, sale of business, buy-sell, web developer, website terms and conditions, licensing (copyrights and trademarks) and settlement. I also write collection letters (for clients who want to collect past due money). ENTERTAINMENT CONTRACTS: as an entertainment lawyer in Los Angeles, I draft production agreements for many Los Angeles entertainment companies, film companies and independent producers. I draft agreements for independent films (including writer, director, producer, actor, etc.) and option agreements. MUSIC CONTRACTS: as a music attorney in Los Angeles, I draft record producer agreements, record label agreements, composer agreements, management agreements, recording artist agreements, master use licenses and synch licenses. Before opening my own law firm, I worked as Vice President of Palan Music (which was later purchased by MCS). FASHION LAW: I provide a wide range of fashion law services for small companies, individual designers and start-ups. While many of my fashion clients are in Los Angeles. I work with companies all over the United States. Before opening my own law firm, I worked as Business Affairs Counsel at BCBG. INTELLECTUAL PROPERTY: in addition to dealing with trademark and copyright issues, I also handle a wide range of your intellectual property needs. For example, I protect your trade secrets with written contracts (trade secrets are one of the only forms of intellectual property protection that require no registration). I also draft work-for-hire agreements so that you can own whatever intellectual property is created for you by the people you hire. I handle domain name issues and U.S. Customs intellectual property registration and enforcement. I can register your brand names and creative works with U.S. Customs to prevent the importation of infringing goods. I handle many other aspects of intellectual property law, including website terms & conditions and web development agreements. LEGAL ADVICE: I serve as General Counsel for many of the small businesses I work with. If your needs are more specific–for instance, if you need a Los Angeles trademark attorney or a lawyer based in Los Angeles who handles business formation–I can also handle your individual legal issues. LITIGATION: while I don’t litigate, I can readily turn to a great team of litigators to help you. INTERNATIONAL: although I practice as an attorney in the U.S., I apply for European trademark protection through the Madrid Protocol application available via the United States Patent and Trademark Office. For many countries not covered by the Madrid Protocol I have a readily-available network of foreign attorneys and agents who can assist my clients with matters overseas in order to receive foreign copyright and trademark protection, as well as intellectual property rights enforcement. EXCELLENCE: if you need an excellent Los Angeles trademark attorney, see what services I provide through the success stories of my clients. If you are searching for top entertainment lawyer in Los Angeles, I have the experience and skills you need. 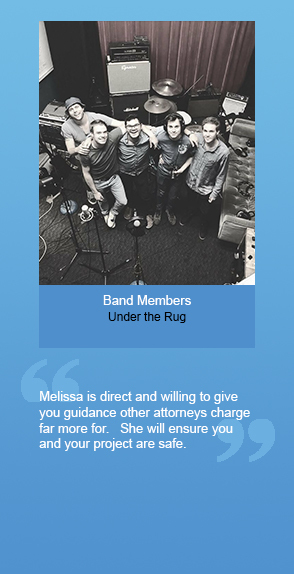 If you want one of the top music lawyers in Los Angeles, see the remarks of some of my award-winning clients and see the music law section of my site. If you need a great contract attorney in Los Angeles, I urge you to inquire about my services. If it’s an excellent Los Angeles copyright attorney you’re looking for, I can help you, and I can teach you how to apply for copyrights yourself. If you need one of the best fashion attorneys in Los Angeles, I’ve worked for BCBG and have provided legal services to many smaller fashion clients. If you want an experienced business attorney, or other related legal services, I encourage you to contact me. I seek to provide the best legal services available in Los Angeles for small businesses and creative individuals at a reasonable price. CLIENTS: I have experience with many types of clients including: start-ups, manufacturers, fashion designers, jewelry designers, filmmakers, artists, authors, actors, producers, writers, digital animators, web developers, videogame developers, photographers, inventors, architects, contractors, interior designers, showroom owners, computer programmers, consumer product manufacturers, music publishers, music producers, musicians, songwriters, record producers, record labels, recording artists, retail store owners, architects, social networking sites, distributors, non-profits, business consultants and other entrepreneurs. While many of my clients are local, I work with clients nationally and even internationally. 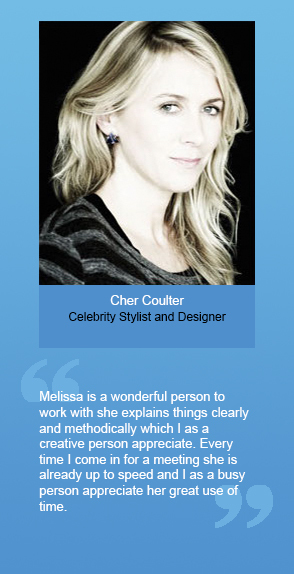 See some of my client success stories. GOAL: my goal as your attorney is to understand what your legal needs are and then to provide the highest quality legal services available. EXPERIENCE: I have extensive training and experience as an attorney, and as a small business owner. While I now own my Los Angeles law office, I previously owned my own product design and manufacturing business for about eight years before becoming a lawyer in Los Angeles, so I have real world experience marketing at trade shows, writing brochure copy, designing brochures, creating press kits, invoicing, collecting and managing teams of sales representatives and employees. Whether you need a trademark lawyer in Los Angeles, an attorney to form your California-based company, business plans prepared or reviewed, contracts written or reviewed, or general counsel for your small business, my business know-how helps me bridge the gap between lawyer and layperson, so that I demystify legal concepts and help my clients get a handle on their legal issues. LOCATION: while I am a lawyer based in Los Angeles, I work with clients throughout California and the United States. 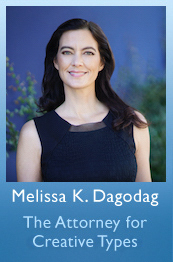 The Law Offices of Melissa K. Dagodag serves the following Southern California cities: Los Angeles, Santa Monica, Culver City, Westwood, Brentwood, Beverly Hills, West Hollywood, Malibu, Bel Air, Pacific Palisades, Burbank, Pasadena, Glendale, Studio City, Encino, Sherman Oaks, Woodland Hills, Hollywood, West L.A., Westlake Village, Thousand Oaks, Calabasas, Agoura Hills, Newport Beach, Palos Verdes, Manhattan Beach, Redondo Beach, Huntington Beach, Laguna Beach, Marina Del Rey, Rancho Park, the Beverly Center area, and downtown L.A..